Golf requires a high level of flexibility and muscle function in order to prevent injuries over time. The feet play an important role in proper golf biomechanics and can influence the movement through the hips and spine. Great golfers have proper foot mechanics that make their swings more efficient and minimize stress on the supporting tissues and surrounding joints. The following will teach you how orthotics can improve your performance on the golf course. Foot movement and golf The movement of the feet during a golf game are unique to the sport. Golfers must be able to properly distribute their weight in order to support their swings. The weight placed on the feet shifts during the swing, making it necessary for the joints to have adequate range of motion and stability. Many golfers experience issues when wearing shoes that aren’t ideal for golfing. Neuromas, lack of mobility, blisters, and injuries to the feet and ankles are common problems that golfers face. Orthotics for improving your golf game Orthotics can address issues related to excessive supination or pronation of the feet. They can be customized to make necessary corrections that are unique to your feet. Orthotics place the joints in proper alignment, which reduces stress on the connective tissues and muscles surrounding the joints. Research shows that orthotics can reduce fatigue when playing golf and create more consistency in the performance of players. They improve gait for players at all levels and contribute to the accuracy and balance of your golf swing. Orthotics also provide stability and help you redistribute your weight to improve overall posture. As a result, they’re an essential tool in adding more power to your golf swing. The right orthotics for your golf game A skilled physiotherapist can help you determine the right orthotics that will improve your golf game and address any existing pain or injuries. Your foot type must be evaluated before choosing a pair of orthotics. Orthotics can be rigid to allow for greater support while others may be more flexible to improve the movement of the feet. Orthotics that provide adequate arch support are ideal for players who have pronation of the feet or a high level of mobility throughout the joints. Orthotics can also improve flexibility for individuals whose feet lack mobility. Your physiotherapist can give you the information you need to get the best orthotics for you. Orthotics can change your golf game by improving movement efficiency, reducing the risk of injury, and providing relief from pain. 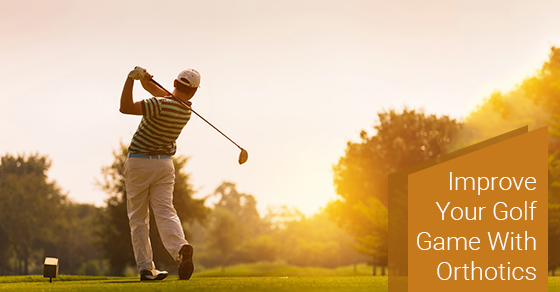 You’ll be able to spend more time on the golf course and see your game progress quickly.